My first introduction to Alex MacQueen’s Master is an entertaining classic Who romp with a guest companion who works very comfortably with Sixie. Missing scientists, zombies, creepy castles, inhuman plots, and a mysterious think tank with the ever-so-subtle name “Dominus” — d’ye think the Doctor will put two and two together this time? It’s a fairly straightforward story of a kind we’ve heard before, with the Doctor and a companion trying to solve a mystery and investigate the Master’s latest evil scheme without falling afoul of it. There’s the usual Doctor-Master oneupmanship, plus some fine lashings of horror. There’s also the added tension that the Doctor’s companion isn’t a regular, so she could meet a sticky end at any moment. Have a trailer. In fact, have Part One for free. 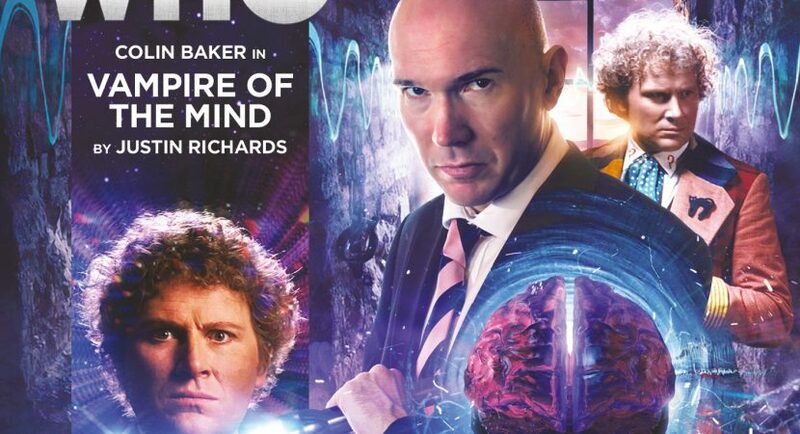 I enjoyed Alex MacQueen hamming up the joint, although his own particular flavour of over-the-top took a little getting used to. Whatever his incarnation, the Master has to have a trademark maniacal laugh, doesn’t he? Kate Kennedy as Dr. Heather Threadstone makes a great guest companion. Since she knew the Doctor as a child, she’s not much fazed by his abrasive manner, and she’s enough of a scientist in her own right to be able to sass back and improvise as needed… a Team Nerd for Sixie, if you will. Her quirky scientist dad is quite likable, too. The Doctor’s friends in this story are more than usually qualified to assist him, which I think adds to the story. Ever since Sarah Sutton praised a script for not having her lines end in in question marks, I’ve become hyper-aware of companions being used to facilitate exposition (“What, Doctor?” “Why, Doctor?” “How, Doctor?”) vs. companions who bring to bear their own particular knowledge and abilities. There’s some hints of the final story in this Master story, but for the most part it’s a good stand-alone adventure. And yes, they covered potential continuity problems. I loved the classic Who callback to the prison where Delgado!Master was housed, and “You will obey me!” “I will reverse the polarity of the neutron flow” was a cute in-joke. I do wonder about the Doctor calling UNIT for help several times. I know that’s become more customary in the new show, and it does happen from time to time in the audios, but it’s a bit like Gandalf and the Eagles: calling attention to them too much makes the audience why he doesn’t call on them at other times. Not a problem unique to this audio; it just reminded me. The script did try to justify it by having the Doctor say he’d use his UNIT credentials to bag a free pass but he wouldn’t call them in to deal with just anything.